It was raining blood at the Pro Tour Hour of Devastation as Paulo Vitor Damo Da Raso dominated the tournament by swiftly burning his opponent to a crisp in a tough but excellent final match. The deck he brought was a deck called Ramunap Red. 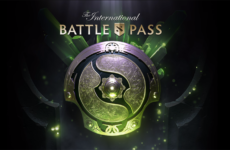 In view of the coming Gameday and many Preliminary Pro Tour Qualifiers let’s have an inside look into the deck. Unsurprising for a red deck that wants to go fast and hit hard, the deck has 12 One Mana Cost creatures, Village Messenger, Bomat Courier, and Falkenrath Gorger. The way I see it, the first game plan of the deck is to win the coin flip, go first and cast one of the 12 One Mana Costs creatures. Which of the creatures should be played first (in the event you draw two or three of the different One Mana Costs creatures)? I believe Falkenrath Gorger should be cast first as most do in the Pro Tour as it is one of the two creatures that does not have haste. All other creatures can be cast and should be cast at other turns as they can hit in the turn they come in. The card included in the deck that surprised me the most is Kari Zev, Skyship Raider. Its stats is mediocre but it does evade magma spray and shock, and provide 1 free damage every attack step. Bomat Courier is another unexpected card with mediocre stats. I would have expected to see Scrapheap Scrounger instead, but the utility it provides in bringing fresh cards into your hand is the main reason it made the cut for the deck. A survived Bomat Courier with four cards removed is better than a hand with no cards. 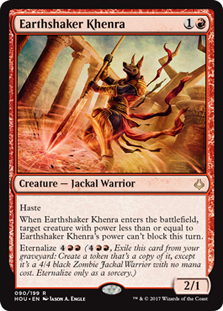 The strongest component of the deck is Ahn-Crop Crasher and Earthshaker Khenra. These two cards are essential as they have haste to keep the pressure and both of them render the creature that was just cast unable to block. It’s best to keep both until there is a creature that is worth rendering unable to block, as a trade is better than to push damage as fast possible since the deck has a lot of reach. The high end finisher is nothing to scoff at. 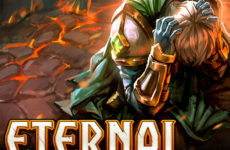 Hazoret the Fervent at most time will be able to attack with haste and Chandra, Torch of Defiance is a recurring 2 damage reach that the opponent has to deal with immediately. 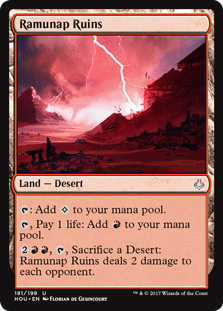 Now comes the name sake card for the deck, Ramunap Ruins. The best reach are cards that don’t use slots in deck and Ramunap Ruins being lands is optimal. The other desserts that the deck run is Sunscorched Desert which deals 1 damage when put into play. My advise is not to play the reach like Shock and sacrifice a desert too early as they are the cards that close the game instead of bringing down your opponent’s life points. Let’s talk sideboard. Paulo Vitor admitted that the sideboard was made mainly to counter mirror matches but it’s not without its uses in other matches. 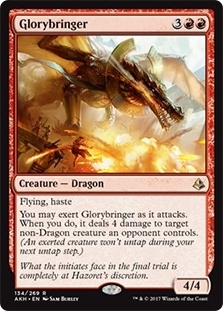 Glorybringer is a great card to bring in against mid range decks that have big creatures as blockers that Earthshaker Khenra can’t target it. Chandra, Torch of Defiance is outstanding against control match ups not only as recurring damage but as an extra card every turn. Aethersphere Harvester, Pia Nalaar and Savage Alliance is useful against decks that clog up the ground in a stall as they provide evasions to push through damage. Meanwhile Sand Strangler, Chandra’s Defeat and Oath of Chandra is brought in mostly for mirror matches. I can see that, most of the time, all four of the Falkenrath Gorger would be taken out as they can prove to be too slow when going second and are bad late game draws compared to the other cards. 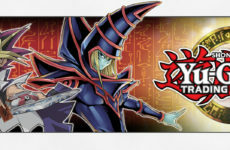 Overall, this deck is well made to be fast enough and to do plenty of damage for Ramunap Ruins to close the game. Still, sequencing of cards to be played is important as knowing which cards to cast and when to cast would be crucial in deciding the pace of the match. It is important that the deck does not lose its gas too early and knowing to how to mulligan a good hand is critical. Well, that is it for the deck that took down the Pro Tour. I hope you would have learned a little bit on how to pilot the deck. On game day, bring on the Red and burn your opponent down with Anubis, Vampires, and a humble Courier. Till next time, keep on slinging. Previous Post AniManGaki 2017 Highlights: Cosplay, Live Music, Video Game Battles & More!